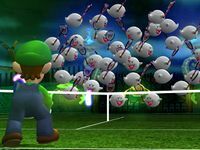 Boo Brigade Return is the Defensive Power Shot used by Boo in Mario Power Tennis. Boo spins around, becoming bigger, until it splits up into many smaller Boos, searching for the ball to hit it back. Curiously, the Boo brigade does not show the "real" Boo with the glowing racket, but it appears once it finds the ball. Sometimes, a glitch occurs where the Boos' faces while they are performing this move will be messed up. The move could possibly be a reference to Boolossus from Luigi's Mansion. This page was last edited on March 16, 2018, at 21:58.